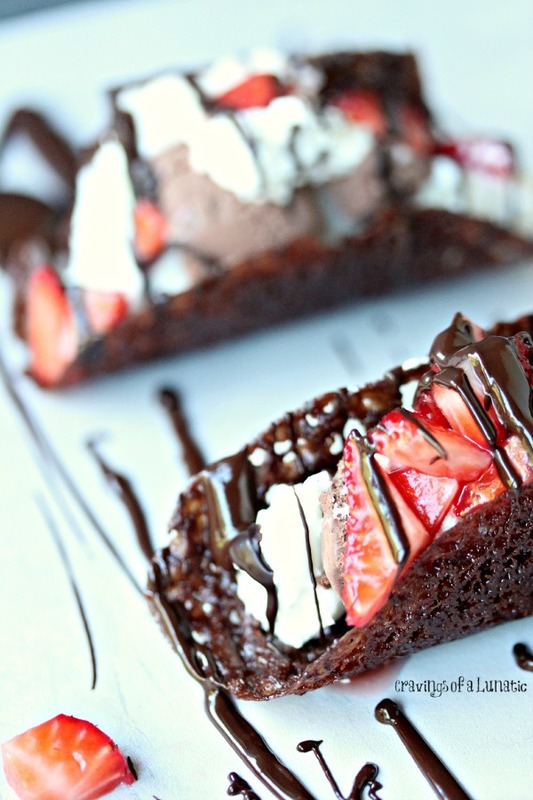 Chocolate Tacos filled with vanilla ice cream, chocolate ice cream, whipped cream and strawberries. I used magnolia lace cookies made with cocoa so they had the crunch of a hard taco. Absolutely amazing, you must try these! If you do not like sugar… move along. If you do not like chocolate… move along. This recipe is indulgent, delicious and a fabulous weekend treat. The taco portion is a meant to resemble a hard taco. I wanted it to crunch and fall apart like a hard taco shell. My favourite tacos are hard shell tacos. So for me this had to be a hard shell version. I know there are lots of soft shell versions out there but I wanted to do something a little different. It’s just how I roll. So I made what is known as a “trumpet cookie”, or also known as a “magnolia lace cookie”. They can be tedious to make so you’ve been warned. It’s totally worth the effort though. I mean look at these things. Be sure to set aside enough time to make the cookies slowly. You want to make about two at a time. I would also highly suggest not making them too big. If you do they will tear as you dry them. In order to form the “taco shape” of these you’re going to drape the warm cookie over a wooden or metal spoon that is suspended with two cups. If the cookie is too large the weight will make it fall apart. So be prepared to lose a couple as you find your cookie making mojo. I also make sure to line my cookie sheets with parchment. The reason for this is once they cook you can cut around each cookie which makes them easier to move around and drape over the spoons to form the shape. This is worth the time and effort, as well as ripping through some parchment. It will make your job so much easier, trust me. I made these for Taco Week for Food Fanatic. 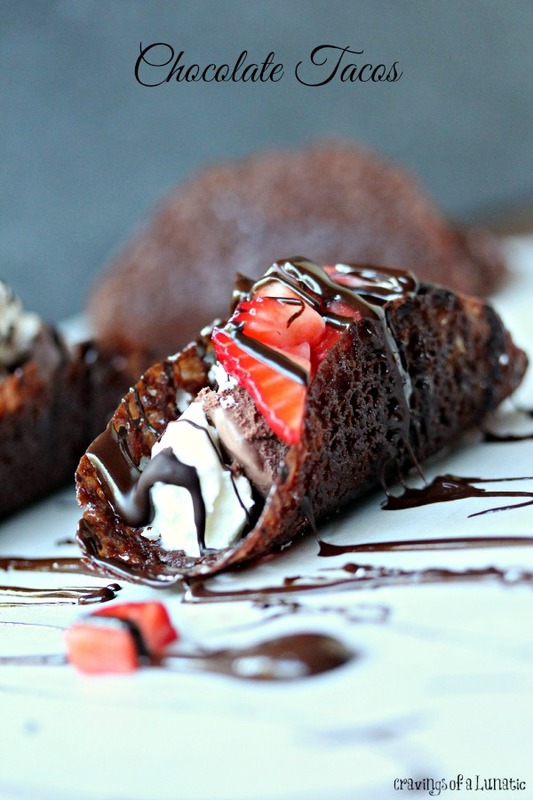 You can see these Chocolate Tacos over there, or grab the recipe here. Get creative with these. Mix it up a bit. Use dark chocolate in the cookies or make them with ginger instead. Use different kinds of ice cream inside the taco. 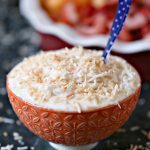 Or top with candy or coconut. The possibilities are endless. I hope you love them. Now rush into your kitchen immediately to make these. Just make sure you bring your appetite, your sense of humour and some napkins. 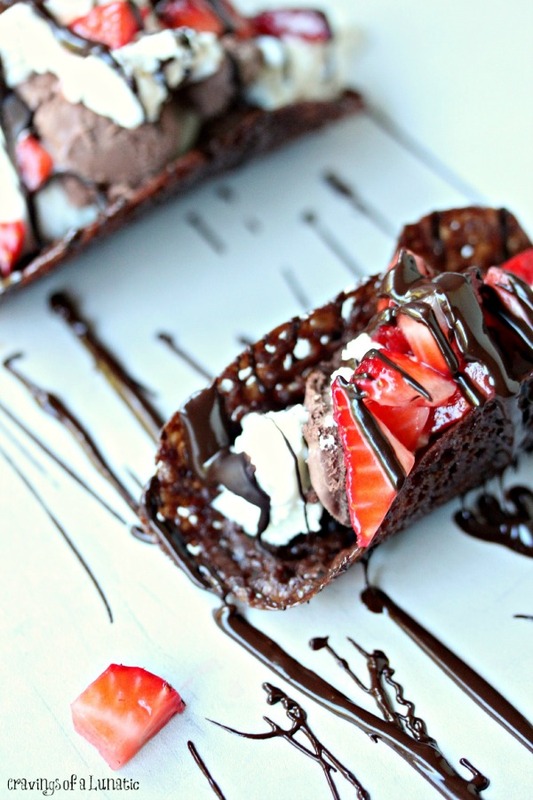 These chocolate tacos are going to blow your mind. 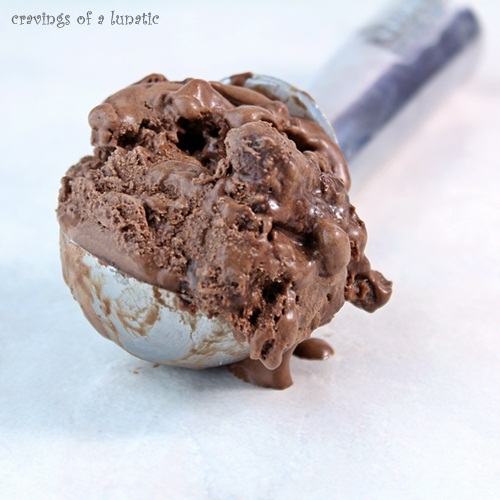 Follow Kim Beaulieu | Cravings of a Lunatic’s board * Chocolate Cravings * on Pinterest. Be sure to keep tuning in. 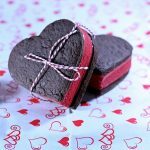 Lots of great stuff coming up, like giveaways, slow cooker recipes and more chocolate recipes. Ha, I fell off my couch reading that. Indulgent is right, these looks downright dangerous! I’ve made lace cookies before so I’m halfway home to these bad boys — can’t wait! I like sugar….I LOVE chocolate…..yepp. This is a recipe for Kayle! YOWZA, Kim, you are killin’ me!! I just wish I lived near you to help you out with your ‘cravings’!! You didn’t. And I’m so. Glad. You. Did! I’m in. And I’ll want seconds. 😉 These look incredible — thanks. Thanks John. These were amazing. Hubs scarfed two in seconds. They are just fun to make and eat. Love sugar. Love chocolate. Love this! Looks gorgeous and would be great at my next dinner party. 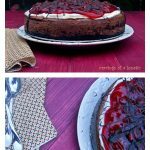 The strawberry adds gorgeous colors and a nice brightness to the rich chocolate – YUM! I didn’t listen to you. I don’t like chocolate, but here I still am. No moving along. Truth is, the rest of the family loves the stuff so I’m always keeping an eye out for a new treat for them. These tacos look as fun as they do delicious. Oh man chocolate is already a weakness of mine but these little babies. I’m dreaming of them tonight. You’ve outdone yourself again, Kim. These look positively amazing! pass me a chocolate taco, I think I’m in LOVE!!! Love this! My belly is growling as we speak! YUM! 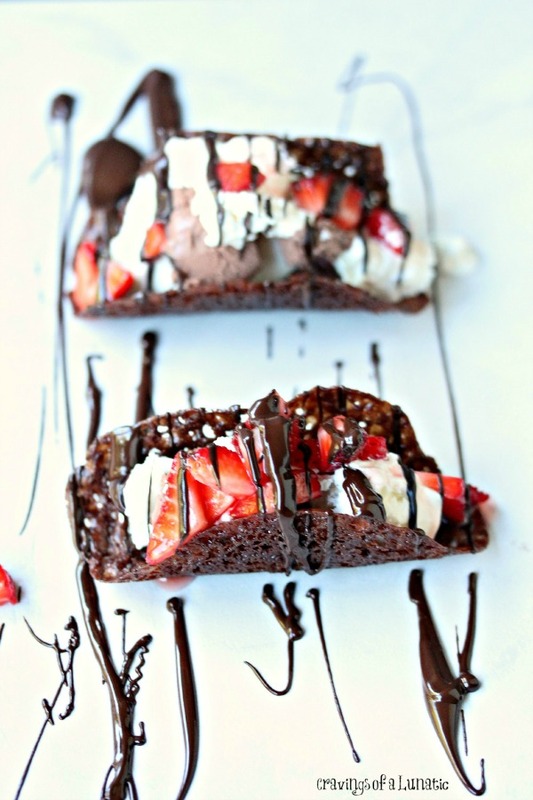 Sugar runs in my veins at this point so obviously, I’m in love with these chocolate tacos. Gorgeous gorgeous gorgeous, Kim. They look so delicate and lovely! 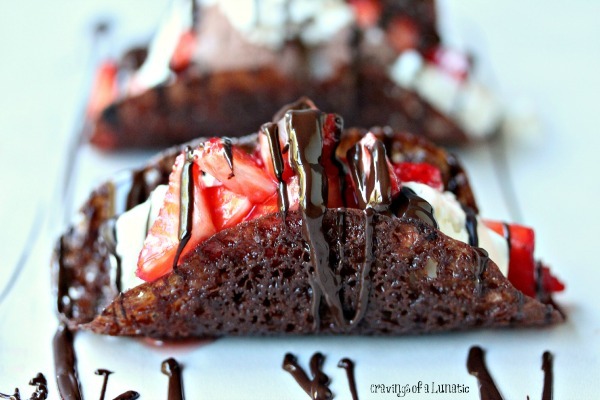 Choco-Tacos ain’t got NUTTIN’ on the Lunie! 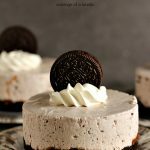 These look flippin’ fantastic, Kim! How about you just send me some of the cookies to save time? And I can go from there. 🙂 These look fabulous, Kim! can the shells be made the night before? If so, how are they best stored. Hi Sondra. I made them the day before, just be careful not to expose them to heat, humidity or dampness. They will go soft again if you do that. My hubby used the microwave then popped these back inside to store and that ruined a few of mine. I stored mine in an airtight container, carefully as they are easily breakable as most hard shells can be, and left them at room temperature for a day. You could store them in fridge but the cold might make them a bit too easy to break. I laid mine on a sheet in a single layer to keep them from sticking to one another, and to help prevent them from breaking. Hope that helps. And thank you so much. I know most people do them with soft shells but I happen to be one of these girls who likes a good crunch. I like hard tacos, even though they break and are messy as heck. Good luck. They are a bit tedious to make but so worth it. 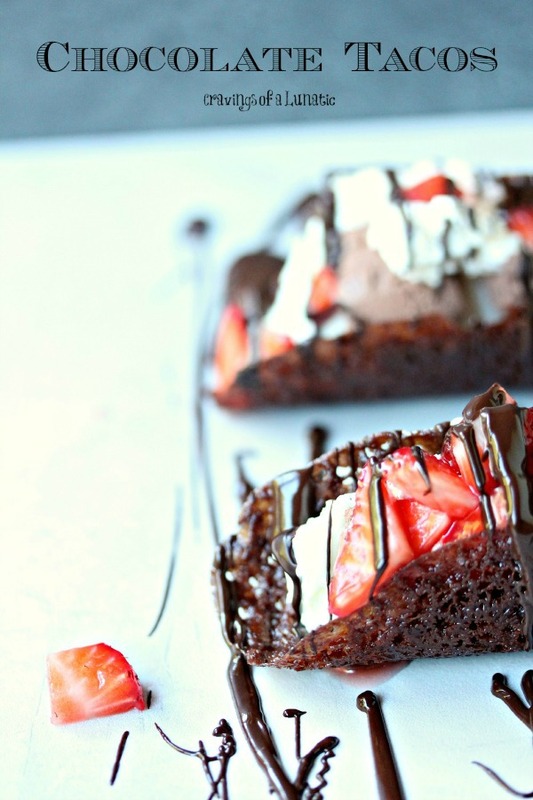 I got a message from Pinterest saying they receiced a copyright complaint because this recipe was on one of my board. I was wondering if it was you complaining and if so, why do you display the red P on your blog if you dont want us to pin your recipes? Hey Julie. I reported a person using the photo without consent from me. Pinterest seems confused and removed ALL the pins. Not what I wanted in the least. I only wanted the stolen photo removed. So no, I would never not encourage readers to pin. This was a mistake, sometimes things like that happen when using social media. Sorry for the inconvenience. Obviously I’d never report someone for pinning from my blog. I love people to pin from my blog. It’s a big part of my business. Hi Robin. You could try honey but I’m not sure if they would burn because of it. If you try I’d start checking the cookies a bit sooner. I’ve never tried them with anything but corn syrup, but if I ran out I’d likely grab honey or agave to try. No guarantee it will work, but in theory it should. I just find honey burns quickly so keep a close eye on them. Let me know how it goes. You can email me if you need any extra help. I’m always happy to problem solve or help in any way I can. Wow!! These look incredible! Thanks for sharing with Merry Monday. This looks really good. It definitely looks like it would help kill a sweet tooth for sure. Oh my! 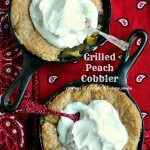 ~swoon~ Thanks for linkin’ up with What’s Cookin’ Wednesday! Wow! 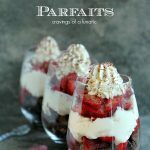 These look delectable! Pinned. Wow! This is something I could really get on board with!